1- The First Time a player was sent off playing for England was on June 5, 1968, during the UEFA European Championships when Allan Mullery was sent off in the 87th minute in a match vs. Yugoslavia that England lost 0 to 1. He was sent off after kicking Dobrivoje Trivic who had tackled him. 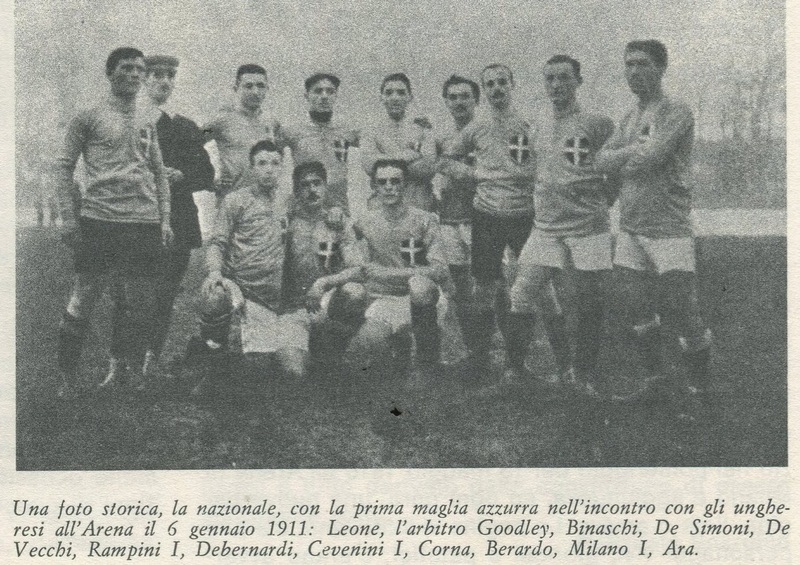 2- The First Time Italy wore the blue jerseys was on January 6, 1911 at Milan in a Friendly vs. Hungary that they lost 0 to 1. 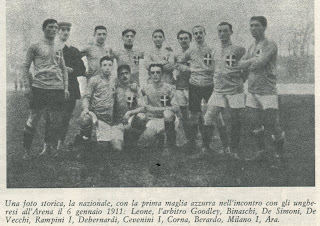 They had worn white jerseys in their first two ever matches in 1910. 3- The First Time the Belgian National Team were referred as ‘the Red Devils’ (Les Diables Rouges) was in 1906. They had won their three matches that year (April 22, 1906 (France 5-0), April 29, 1906 (Holland 5-0) and May 13, 1906 (Holland 3-2). Pierre Walckiers, the Editor of ‘La Vie Sportive’ wrote that their players had conducted themselves like ‘Red Devils’ and the term became part of the Belgian Football Lexicon. 4- The First Time the French National team defeated England was on May 5, 1921, when they won by a score of 2 to 1 at Paris’ Pershing Stadium. It must be pointed out that the England team was actually the England Amateur team, but was nevertheless a significant achievement for a team that had lost heavily over the years to the same Amateur team. The match date also marked the Centenary of Napoleon’s death. 5- The First Time an English Club ever won the League and Cup Double was on the inaugural season of English League (1888/89). Preston North End achieved this feat by going through the season undefeated and became known as ‘The Invincibles’.